Most everyone violates a traffic law at one time or another, but not everyone is caught. It is more probable than not you have sped up to go through a yellow traffic light, not come to a complete stop at a stop sign before proceeding on or not used the turn signal. These may all seem like minor offenses, but they are traffic violations nonetheless. 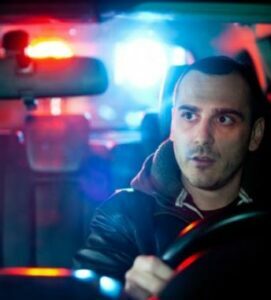 What about when a police officer witnesses the violation and the driver is pulled over? Here we give advice on how to act when pulled over by police. The first thing to remember is remain calm and courteous in all interactions with the officer. Do this even when you think your constitutional rights have been compromised. You have the right to remain silent whether placed under arrest or temporarily detained. Outside of providing your license, insurance, registration and name when asked, you can respond with, “I choose not to answer that question.” However, some states require you to answer basic identifying questions by police (name, address). Turn on the vehicle’s emergency flashers to acknowledge the officer. Pull the vehicle over to a safe area – right side of the road. Look for a wide-shoulder and if night time, look for a well-lit area. If you need to cross over multiple lanes, do it safely. Drive at a slower speed if you need to travel a short distance to pull over. Stay in your vehicle. Getting out as soon as your car stops may give the officer the impression you have something to hide in the car or you are being aggressive. As soon as your car is at a stop, turn the engine off and roll down the window. If night time, turn the dome light on. Stay calm; be respectful and polite no matter what occurs. As the police officer approaches your driver door, keep both hands on the steering wheel and remain still. If you do not plan to contest the ticket a quick, “I’m sorry officer. I’ll pay better attention next time.” could get you off with just a warning. Wait for the police officer to ask for your license, registration and insurance. This prevents suspicious or negative assumptions by the officer. You can deny the police officer permission to search you or your car. In order to search your vehicle the officer must have either your consent to do so or probable cause. Keep in mind, if the officer has probable cause or you are placed under arrest, the officer can search you and your car without consent. Regardless, it is probably a good idea to exercise your Fourth Amendment right. In some states if you are carrying a firearm, it is required you let the officer know and then provide documentation to carry when requested. The police officer is allowed to hold the gun for the duration of the stop. After providing all documentation the officer needs, return your hands to the steering wheel. Do not argue with the officer. Contest the ticket in front of a judge in court; not on the side of the road during a traffic stop. If the police officer decides to issue you a citation, he will ask you to sign it. Signing it is recognition you received it and not an admission of guilt, and you promise to show up to court on the date indicated on the ticket or pay the fine. If arrested, you have the right to ask for an attorney and should do so immediately. Re-enter traffic safely. Take the time to replace your documents where they are stored and compose yourself prior to merging back into traffic. Do not forget the turn signal. Seeing blue or red lights flashing in the rear-view mirror is never pleasant, even when you think “That can’t be for me. I didn’t do anything wrong.” What are the most important things to remember if you are pulled over? Stay calm, be polite, admit no guilt responding only with short answers to any questions, and make no sudden moves and only provide documentation to the officer when asked to do so. Knowing how to act when pulled over by police can make the difference of a smooth encounter with you driving away, to an arrest when the stop goes wrong. If the worst happens and you are placed under official arrest, immediately ask for an attorney.